In the following pages an attempt has been made to examine anew in the light of God's Word some of the profoundest questions which can engage the human mind. Others have grappled with these mighty problems in days gone by and from their labors we are the gainers. While making no claim for originality the writer, nevertheless, has endeavored to examine and deal with his subject from an entirely independent viewpoint. We have studied diligently the writings of such men as Augustine and Acquinas, Calvin and Melanethon, Jonathan Edwards and Ralph Erskine, Andrew Fuller and Robert Haldane*. And sad it is to think that these eminent and honored names are almost entirely unknown to the present generation. Though, of course, we do not endorse all their conclusions, yet we gladly acknowledge our deep indebtedness to their works. We have purposely refrained from quoting freely from these deeply taught theologians, because we desired that the faith of our readers should stand not in the wisdom of men but in the power of God. For this reason we have quoted freely from the Scriptures and have sought to furnish proof-texts for every statement we have advanced. It would be foolish for us to expect that this work will meet with general approval. The trend of modern theology-if theology it can be called-is ever toward the deification of the creature rather than the glorification of the Creator, and the leaven of present-day Rationalism is rapidly permeating the whole of Christendom. The malevolent effects of Darwinianism are more far reaching than most are aware. Many of those among our religious leaders who are still regarded as orthodox would, we fear, be found to be very heterodox if they were weighed in the balances of the Sanctuary. Even those who are clear intellectually, upon other truths, are rarely sound in doctrine. Few, very few, today, really believe in the complete ruin and total depravity of man. Those who speak of man's "free will," and insist upon his inherent power to either accept or reject the Saviour, do but voice their ignorance of the real condition of Adam's fallen children. And if there are few who believe that, so far as he is concerned, the condition of the sinner is entirely hopeless, there are fewer still who really believe in the absolute Sovereignty of God. In addition to the widespread effects of unscriptural teaching, we also have to reckon with the deplorable superficiality of the present generation. To announce that a certain book is a treatise on doctrine is quite sufficient to prejudice against it the great bulk of church-members and most of our preachers as well. The craving today is for something light and spicy, and few have patience, still less desire, to examine carefully that which would make a demand both upon their hearts and their mental powers. We remember, also, how that it is becoming increasingly difficult in these strenuous days for those who are desirous of studying the deeper things of God to find the time which such study requires. Yet, it is still true that "Where there's a will, there's a way," and in spite of the discouraging features referred to, we believe there is even now a godly remnant who will take pleasure in giving this little work a careful consideration, and such will, we trust, find in it "Meat in due season." We do not forget the words of one long since passed away, namely, that "Denunciation is the last resort of a defeated opponent." To dismiss this book with the contemptuous epithet--"Hyper-Calvinism!" will not be worthy of notice. For controversy we have no taste, and we shall not accept any challenge to enter the lists against those who might desire to debate the truths discussed in these pages. So far as our personal reputation is concerned, that we leave our Lord to take care of, and unto Him we would now commit this volume and whatever fruit it may bear, praying Him to use it for the enlightening of His own dear people (insofar as it is in accord with His Holy Word) and to pardon the writer for and preserve the reader from the injurious effects of any false teaching that may have crept into it. If the joy and comfort which have come to the author while penning these pages are shared by those who may scan them, then we shall be devoutly thankful to the One whose grace alone enables us to discern spiritual things. 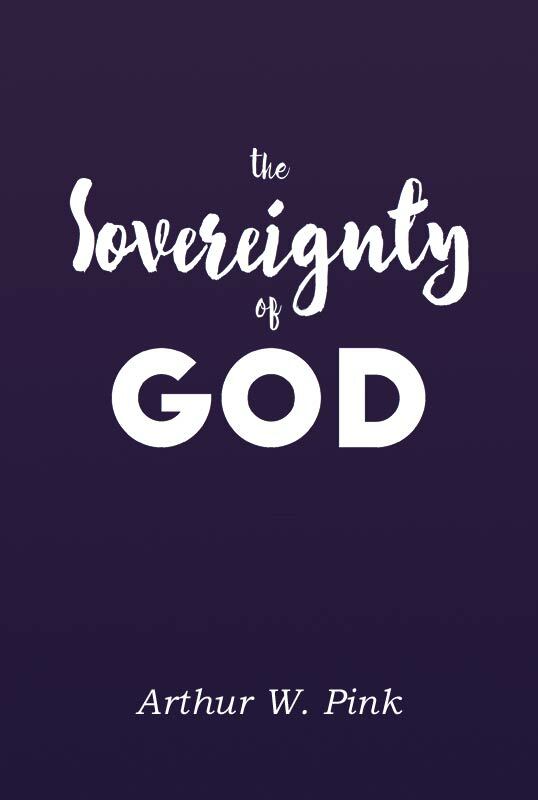 A hardcover version of The Sovereignty of God, published by Visionarion Press is available for purchase here at Reformation Heritage Books.